In what is a first for a Canadian carrier, Telus discount provider Koodo is offering to unlock users’ smartphones for free with the activation of a SIM-only plan. Carriers have been offering discounts between 10% of one’s monthly bill and $10 from the total for bringing an existing device to their networks, but Koodo is going one step further by offering free phone unlocking — a $35 value — and a free SIM card when activating a “bring your own device” plan. 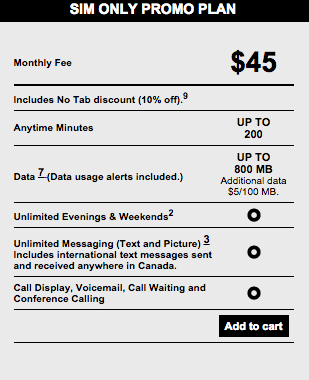 Koodo is also offering a promo SIM-only plan for $45 that offers 200 national minutes, 800MB of data, unlimited evenings and weekends starting at 5pm, unlimited messaging, MMS, call display, voicemail, call waiting and conferencing. It’s not a great plan, but offers a fair amount of data for the price. It’s unclear whether this is a permanent change for the discount carrier as it tries to woo customers from competing Fido and Virgin, but it shows that the company is willing to work with customers to overcome both practical and educational barriers to BYOD: phone unlocking. Many customers who inherit a phone from family or friends may not understand that it needs to be unlocked — a term for enabling compatibility with a carrier other than the one it was purchased from — to work on Koodo, even if it is network functional.